TOD contributor, David M., wrote a good, long response to the Johnny Patience "Zone System is Dead" blog post which deserved it's own page - so here it is. If you haven't already read Johnny's post then you should pay it a visit so we're all on the same page. People have been writing about the Death of the Zone System for a long time. Perhaps they misunderstand it. Mr Patience certainly does. Consider: “holding your meter into the darkest part of the picture and letting the highlights fall where they will, brings zones “II” to “IV” up to zone “V”…” Almost everything here is odd. You may care to list the oddities yourself. Let’s list one. If he is bringing Zone 2 up to Zone 5, doesn’t this sound exactly like overexposing by three stops? He says the Zone System is wrong to do this, and then suggests that his own way of working is to overexpose by several stops. Confusing for a bear of very small brain. He is entirely right that modern emulsions are far more forgiving than those of the 1930s and’40s. He is entirely right that modern variable contrast papers offer undreamed of flexibility in darkroom printing. He is right that scanning offers further possibilities, unavailable to but not undreamed of, by Saint Ansel. These factors mean that a photographer may carry a little notebook with a list of exposures – Sunny: 1/500. Cloudy: 1/250 – and get an acceptable print. Have they stopped printing these on the cartons? In his short article, Mr Patience does not describe his own practice when metering. Does he really hold his meter in the shadows or is he content to be ruled by his notebook? We must assume some act of measurement takes place, otherwise he can have no idea if he has truly “overexposed” by the amounts that he claims. The phrase “acceptable print” brings us to Mr Patience’s chosen examples. Are they any better than acceptable? In my view, no. He may like them very much and presumably he has chosen to exhibit them for that reason. I should point out that in this context we must put aside any question of liking them, as they are not given as examples of his aesthetic choices but to illustrate his personal system of metering, exposure and development and the subsequent, inevitable death of the Zone System. I am a little baffled by his choices. That picture of the diner (below) looks like a classic textbook example of an underexposed negative, not overexposure by one stop and overdevelopment by one stop. What is one-stop overexposure anyway? Does he mean N+1 in Zone terms? Wouldn’t we all suggest that a little more exposure for those gloomy shadows and a perhaps little less development or a lower grade of paper for that burnt-out exterior? By the by, Mr Patience is not quite right about “box speed”. True emulsion speed is determined by examining the characteristic curve and noting where the toe meets certain conditions with a very specific development routine. The figure on the box is a pragmatic compromise determined by subjective testing and marketing although in practice the difference is small. Enough of this knocking. Let’s be positive. Can we produce an acceptable print from a grossly (in conventional terms) overexposed negative. Yes indeed, we can. A skilled printer can produce remarkable results from all kinds of negative, but that isn’t quite the point. Let’s go back to one of his examples. Are we happy with nine minutes – NINE MINUTES – exposure time in the darkroom for that nice spotty dog in the snow (which, incidentally, I like). Just enough time to boil and eat an egg, with nice toasty buttered soldiers (and we haven’t even mentioned dodging and burning...). 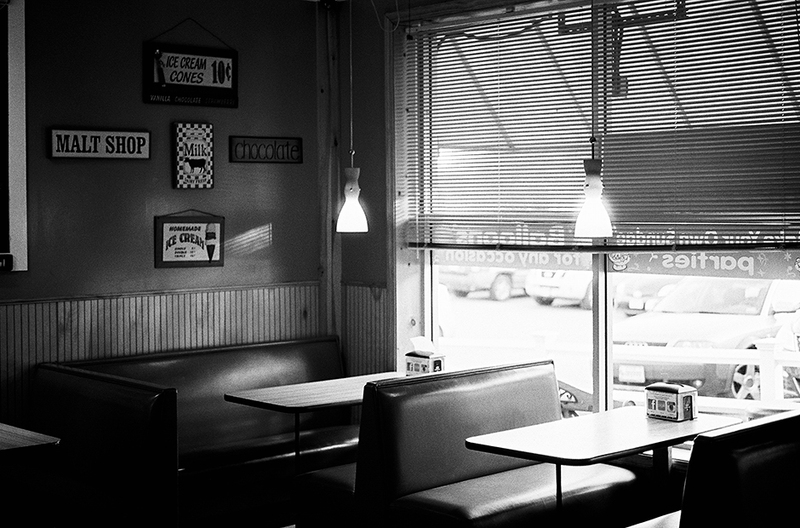 He captions his snow scene: ”…Tri-X, overexposed by five stops, overdeveloped by one stop.” He doesn’t mention placement. A Zone System user would say “Tri-X, rated at 12.5 ASA, N+1 dev.” and mean the same thing. Where is the conflict if the two systems say the same thing? Let us re-state the purpose of the negative. Its principal function is to collect as much information as possible from the scene. The purpose of development is to preserve it in a useful form. Beyond a certain point, exposure can capture no more information and extra development can preserve it no better. Naturally, we all discover that we have personal preferences, but elevating personal preferences to a prophecy of inevitable extinction seems to overstate the case somewhat. On the other hand, we may commend him for stirring up discussion in the sometimes rather introverted fine print community. 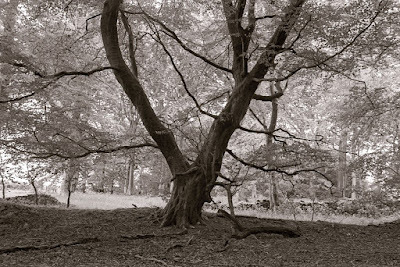 Mr Patience considers that very dense negatives produce prints that he likes and he has shown us some examples. This seems to invite direct comparison with Mr Adams and perhaps Mr Gibson and we are free to make up our own minds about his advice. Let’s do it now.